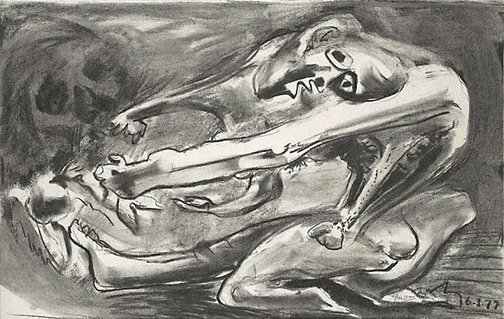 Gleeson's drawings of the late 1970s generated new images and ideas for paintings. He filled a number of drawing pads with drawings in charcoal and pastel - charcoal in particular, a 'painterly' medium, lent itself to free expression without the distraction of colour. Ten of his drawing pads were gifted to the AGNSW in 1994-95. Hendrik Kolenberg and Anne Ryan, 'James Gleeson: drawings for paintings', Art Gallery of New South Wales, 2003, pg. 60. Signed and dated l.r., pencil and charcoal "Gleeson 6.3.77".